• 1624 Virginia establishes the Anglican Church. • 1630 English Puritans found Massachusetts Bay< Colony where church and state are closely linked. • 1636 Roger Williams is banished from Massachusetts Bay Colony and founds Rhode Island as a haven for religious dissenters; first colony to allow freedom of worship. • 1649 Maryland adopts Act of Toleration providing religious liberty. • 1681 Quaker William Penn founds Pennsylvania, which permits religious freedom and soon becomes the most religiously diverse colony. • 1702Maryland establishes the Anglican Church. • 1786 Virginia enacts Thomas Jefferson’s “Statute for Religious Freedom,” disestablishing the Episcopal (formerly Anglican) Church. • 1789 US Congress passes the Bill of Rights. • 1791 States ratify the Bill of Rights, including the First Amendment. • 1818 Connecticut disestablishes the Congregationalist Church. • 1833 Massachusetts disestablishes Congregationalism, the last state establishment. In God We Trust” is added to currency. • 1892 Trinity v. the Supreme Court declares that the United States is a Christian nation. • 1920 American Civil Liberties Union is founded to defend and preserve the individual rights and liberties guaranteed by the Constitution and laws of the United States. 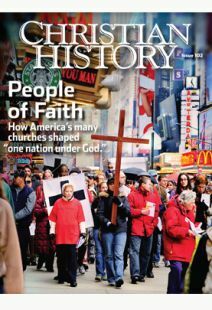 • 1947 Americans United for the Separation of Church and State (initially Protestants and Other Americans United for the Separation of Church and State) is formed to defend religious liberty and argue for government neutrality on religious matters. • 1954 “Under God” is added to the Pledge of Allegiance. • 1962 Engel v. Vitale rules school prayer unconstitutional. • 1963 Abington School District v. Schempp rules devotional Bible reading in public schools is unconstitutional. • 1971 Lemon v. Kurtzman establishes standards for legislation pertaining to religion. • 1996 Charitable Choice Act is passed, allowing government officials to purchase services from religious providers. • 2001 President George W. Bush creates the Office of Faith-Based and Community Initiatives.